FREE patch w/the first 250 Mini Kwaiken orders! 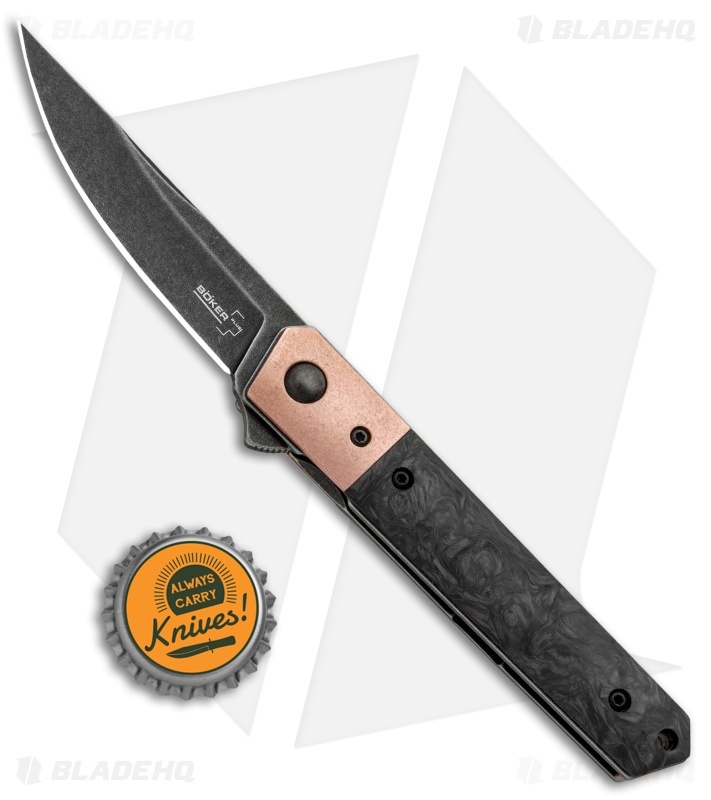 This Blade HQ exclusive Mini Kwaiken features a Smokewash finished blade and a carbon fiber handle with copper bolsters. 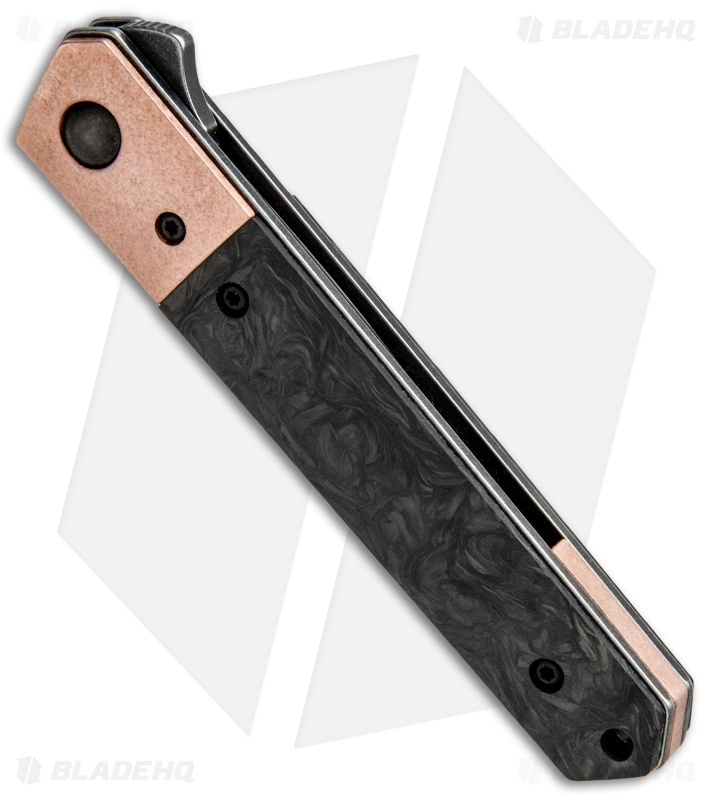 With it's tactical-gentleman aesthetic and clean lines, the Kwaiken has set the new standard for what a modern gentleman's carry should be. Based on Lucas Burnley's popular design, the Mini Kwaiken has the same build as the regular Kwaiken we're all familiar with, but in a more compact, EDC-friendly size. This model has a premium VG-10 steel blade and carbon fiber scales with copper bolsters. An IKBS ball bearing pivot is standard, along with exemplary action from the flipper opener, which features jimping. The tip-up carry clip is set into the scale, for a fine finished look. Yet another kwaiken, and this one is quite attractive. The copper and marbled CF make a good combination. Opening is crisp and blade lockup is solid, though a bit late on mine. There is some minor lock stick but I expect that to go away with use. I've been a bit critical of Boker's Taiwanese- and Chinese-made knives. 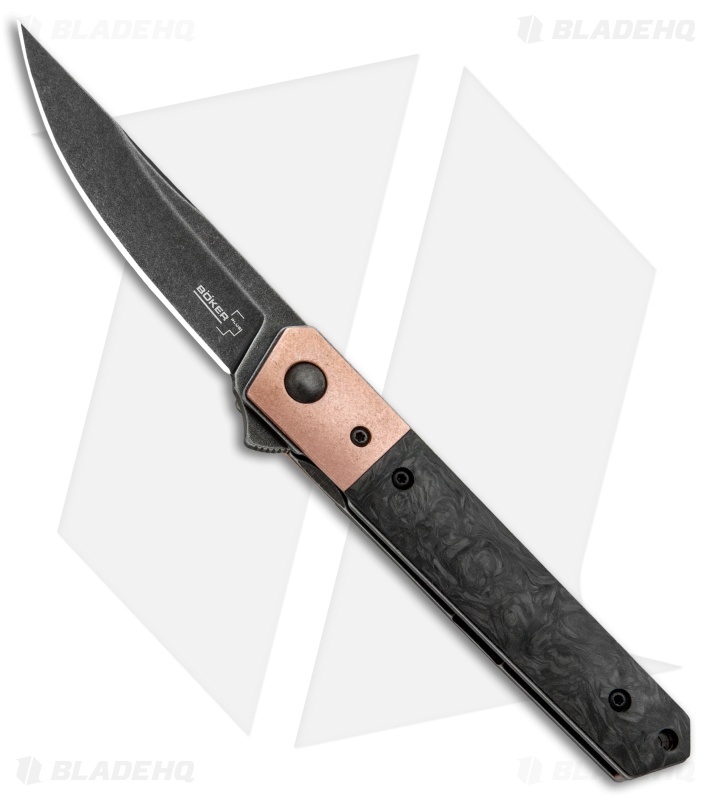 The Boker Plus Kwaiken makes up for that. This knife has wonderful fit and finish. The design is atrractive, and materials blend perfectly. It feels very high end. I love that the marbled copper matches up nicely with the stonewash black blade and the carbon fiber handle. The Kwaiken has good weight to it and feels very solid in the hand. The VG-10 blade is centered. I would like a slightly deeper pocket clip. Sideways, the knife has a nice taper with angled ends. The flipper works very smoothly. The blade snaps into place with purpose, thanks to the IKBS ball bearing assembly, rather than synthetic or metal washers. 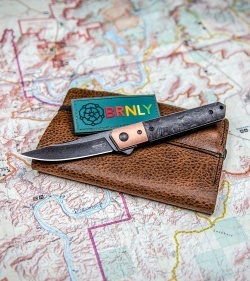 I can't really think of anything harsh to say about this knife. This model is the one that drove me to finally try the kwaiken. Absolutely beautiful fit and finish. Action is really good as well. There is a slight amount of lock stick but it is still new and it should go away with use. I would love to see them put a little better steel on this model, but vg10 is fine edc. The marbled carbon fiber is a very nice touch. The action is great but was a little stiff to close at first, some very slight pivot adjustment along with a bit of oil remedied that easily.